The saying goes that even a stopped clock tells the correct time twice a day. This is a pretty good description of the Trump administration’s approach to trade policy: their analysis and motivations are almost never right, yet they occasionally hit on a decent idea. But then they move quickly off of it. This is illustrated perfectly in their recent moves regarding the Korea-U.S. Free Trade Agreement (KORUS). News reports suggest that the Trump administration is preparing to withdraw from KORUS. The motivation for this seems more driven by Trump pique that the South Korean government is not rubber-stamping his preferred policy stance on the current tensions in the Korean peninsula, rather than on any coherent economic analysis. Yet, it’s true that on pure economics, KORUS should be seen as a failure. The KORUS deal, approved in 2011, was supposed to result in rising U.S. exports. However, U.S. exports to Korea actually fell $1.2 billion between 2011 and 2016, while imports from South Korea soared—increasing the bilateral trade deficit by $14.4 billion and eliminating more than 95,000 jobs in the first three years alone. The glaring omission in KORUS was failure to include enforceable provisions on currency policy. Korea is a well-known currency manipulator, and it also has the fourth largest current account trade surplus (the broadest measure of trade in goods, services, and income) in the world. Ending Korean currency manipulation and revaluing the won is the surest way to increase U.S. exports and stop the surge in Korean imports in the United States, demonstrating the value of this strategy for rebalance overall U.S. trade and helping to rebuild U.S. manufacturing. Recent estimates suggest that rebalancing U.S. trade will require Korea to revalue the won by at least 32.7 percent. 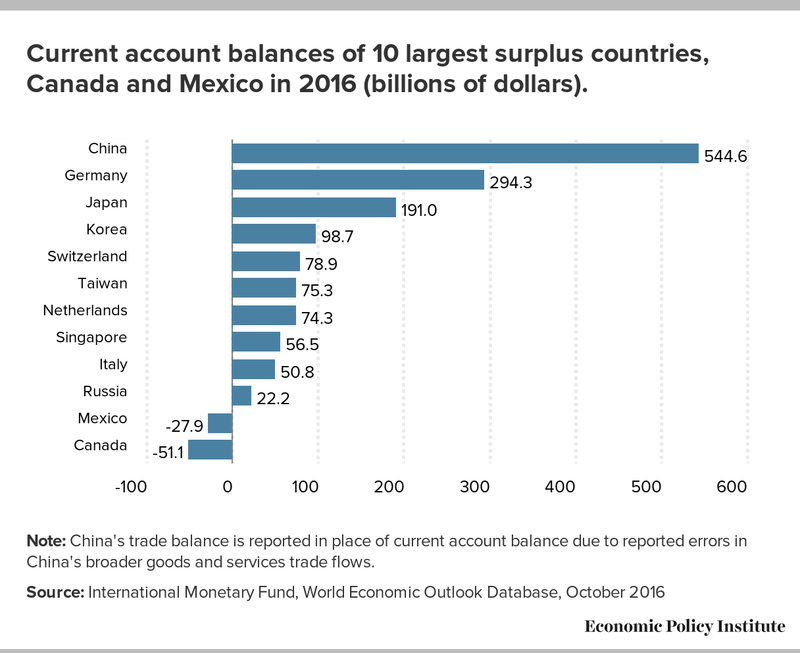 Current account balances of 10 largest surplus countries, Canada and Mexico in 2016 (billions of dollars). Note: China's trade balance is reported in place of current account balance due to reported errors in China's broader goods and services trade flows. This omission of currency provisions and the resulting U.S.-Korea trade imbalance has been true all throughout the Trump administration and yet it’s only now, in the midst of a foreign policy crisis on the Korean peninsula that has President Trump frustrated with South Korea’s independent stance, that the threats to withdraw from KORUS are being made. It is unfortunate that the president has chosen to use trade policy as an element of his ham-handed geopolitical maneuvering. In the past, this linkage between trade and foreign policy has usually meant trading away our manufacturing base in order encourage our trading partners to cooperate on foreign policy objectives, as Trump did earlier this year when offered China better terms on a trade deal “if they solve the North Korea problem.” Does it matter that the Trump administration’s reasons for withdrawing from KORUS are based on personal pique and bad foreign policy considerations? Isn’t withdrawing from a flawed trade treaty good enough? Not really. Withdrawing from KORUS will do little-to-nothing to address the U.S.-Korea trade deficit that the Trump administration claims to care about. Genuine policy attention to currency misalignment would—but there is little to no sign that the administration knows or cares about this. Withdrawing from KORUS simply to inflict political pain on a trading partner whose government is not being compliant on other foreign policy issues is a classic stopped-clock problem. The correct impulse to withdraw from the treaty will soon be left behind, and the correct actions to make trade work better for working Americans will be forgotten.